This’ll get you in the mood. A quick reminder you can help Seahawks Draft Blog by making all your pre-Super Bowl purchases via the official NFL store. Earlier today they made available some white Russell Wilson jersey’s (Seattle will play in white on Sunday) with the Super Bowl patch on the correct side. They’ll probably sell out quite quickly so hurry if you want one. For those who don’t know, I am a journalist by trade. I work for the BBC in England as a radio host and spend a lot of my time going to press conferences and conducting interviews. Usually, the idea of daily access to players and coaches plus a specially organised ‘media day’ would be music to my ears. At the end of the day, journalists have a job to do. They have a boss like everyone else, and they have to deliver results. Putting all of the players and coaches in a giant arena or on a podium just makes life easy. When you get access every day, you barely even have to try. So I approached the idea of media day with some relish. But as I watched it unfold, I couldn’t quite believe what was happening. I usually wait with great anticipation to hear what Pete Carroll has to say. For the first time today, I was bored. In fact not even bored. I wanted to put my hands over my ears and run around the room screaming for this to end. Right now I will listen to anything else. “Music” by Pitbull. Janice from ‘Friends’ laughing over and over again on repeat. Perhaps even a Colin Kaepernick interview. I cannot cope with any more half baked press conferences involving the Seattle Seahawks. You can only hear so many questions about a defense, Percy Harvin or Marshawn Lynch’s interview technique. And none of this is the players or coaches fault. I’m absolutely stunned by how much they have to do in this — the most important week of the season. Surely they’d be better served concentrating on the game? After all, even as a member of the press, I just want to see a great contest. I want the players to be completely prepared, relaxed and concentrating on what could happen on Sunday. I want them going about their usual routines — so they are ready to perform as they have in the previous 18 games. If they can spare 10-15 minutes once or twice along the way — excellent. That access should be granted. But what we’ve seen this week is needless overkill. What on earth is anyone getting out of these endless press conferences? If the fans are anything like me, they’re bored stiff. If there are journalists out there who still need access after media day — what on earth were they doing? We’ve had two more press conferences since Tuesday’s press bonanza. I had to turn today’s interviews off. Enough is enough. Let’s play some football already. We simply do not need all of this coverage. Not in an age where press conferences are streamed live into our homes. Not in an age where everything is on Twitter, usually repeated by multiple journalists. And not in an age where players themselves can directly give us an insight into their personalities via their own social media accounts. We don’t need to hear Carroll answer a question about whether he looks like Owen Wilson. We don’t need to hear Russell Wilson talking about his hair. Absolutely nothing interesting has come out of all this over the last few days. No fresh or interesting angles what so ever. All of the players are on best behaviour. All are speaking in cliche’s just trying to survive the chaos. What a completely pointless waste of time for all involved. The NFL needs to review the schedule leading into its show-piece event for next year. The whole thing turned into a shambles this week. Too much talk about what Marshawn Lynch didn’t say, too much talk about what Richard Sherman did say and too many questions about Justin Bieber. Either have media day and nothing else, or just have a couple of press conferences involving the coaches and key players who are used to speaking for the team. ESPN can have Stephen A. Smith repeat over and over again that he hasn’t made his pick yet but here’s 100 reasons why Denver will win. Fox can have Jay Glazer flogging designer watches or whatever he does on Twitter these days. It’s what they’ve done anyway this year, even with all the access. Time for a rethink, before we’re all bored into submission and start watching the NBA again. Now — less of the serious stuff. Time to mix things up a bit after the Senior Bowl. A lot of you will linger on the fact I have Seattle picking at #31 and Denver at #32. I’ve done it this way for so many weeks now, I’m not going to change. This isn’t a Super Bowl prediction. Don’t see it that way. Call it superstition or whatever. The two picks would be the same if I flipped the teams anyway. They have to make the most of this pick. And that means taking Clowney, and not reaching for a QB. Jeff Fisher traditionally hasn’t drafted offensive linemen early. If they believe in Sam Bradford, give him Sammy Watkins. He could be the sparky competitor Gus Bradley needs at QB to continue the rebuilding job in Jacksonville. I’m becoming less and less convinced by all the ‘Cleveland loves Johnny’ talk. It could be a smokescreen. Just a fantastic talent who they can build around going forward. A genuine building block for the Raiders. The Falcons could consider moving up for Clowney, but tackle is their next biggest need. Some teams will rate Lewan much higher than others. He could still land in the top ten. He’s not a prototype passer for Norv Turner’s offense, but they need a quarterback badly. The more I watch Evans, the more convinced I am he’s a top ten pick and a true #1 receiver. Just a really good, competitive football player. Would look great alongside Megatron. I’m still not overly convinced by Barr. Ray Horton’s arrival as defensive coordinator means they need a 3-4 OLB. Might be set for a Bruce Irvin-style switch to linebacker. Make the defense this teams identity. The Rams might wait on a tackle at #2 because of the depth at the position. I like Kouandjio more than most. Every team in the league is looking for a rangy safety. The Bears need one badly. Terrific athlete with the potential to be the next big time tight end. Terrific football player, totally underrated. Could play guard or tackle. The Ravens know what they’re doing. I’m now a believer. Donald’s worthy of a grade in this range for me, despite a lack of size. Intelligent, grounded receiver with YAC value. Surprisingly not an elite speed guy though, so won’t WOW at the combine. Massive tackle prospect who could easily go higher than this. Miami desperately needs a left tackle. With 10-wins and an elite defense, they might feel comfortable investing in the future. Carson Palmer in 2015 will be due $12m aged 36. Green Bay needs to keep adding toughness to that defense. It’s way too soft at the moment and holding them back. Chip Kelly likes defenders with length and speed. Underrated prospect who will look good at the combine. Big, third down converting tight end. Would have an instant impact in this offense. It’s not a great class for cornerbacks, but Dennard looks like the best available. Had a productive season and turned a few heads in 2013. Could provide a dynamic double threat with Josh Gordon. Definite first round talent for me. Playmaker and a safety net. The Saints could use an edge rusher. To go this high, Ford needs to prove he has 4.4 speed. Insane potential. Give him a year and he could be another Josh Gordon. Seriously. Major upside interior lineman. Big-time athlete whose best football lies ahead. Don’t be too surprised if he suffers a fall. 2013 was a big let down for Nix. Benjamin frustrates the hell out of me, but his upside potential is phenomenal. Seattle needs a receiver with his size. They’ve finally moved on from that play against Baltimore last season, but the Broncos still need a safety. One narrative I really don’t get is this idea Seattle’s offense is mediocre. Not unless a top-ten offense is classed as mediocre these days. According to DVOA, Seattle had the #7 offense in the league in 2013. Combine it with the #1 defense and #5 special teams unit — and it’s easy to see why they were ranked #1 overall as the most complete team in the NFL. Yes — they had some issues late in the season and haven’t exploded in the playoffs either. There’s a pretty obvious reason for that. They’ve consistently faced elite or very good defensive units since week 13. It’s not really surprising that they’ve only averaged 22 points in those seven games. In the three games before this stretch, they faced Tampa Bay (#8), Atlanta (#29) and Minnesota (#27). They averaged 34 points in those three. What some people perceive as a dramatic slump or evidence of mediocrity, is probably more the opposition performing to standard from week 13 to the NFC Championship game. Seattle faces the #15 defense in the Super Bowl. Yet it’s the #15 defense without Chris Harris (Denver’s best corner), Von Miller (their best pass rusher) and Derek Wolfe (a very good defensive tackle). What’s more, while certain media outlets have focused on Seattle’s offense — they’ve been willing to look beyond some of Denver’s defensive issues. Yes — the Broncos played very well against an injury hit New England offense in the AFC Championship game. But look at the complete schedule this year. They conceded less than 15 points on just two occasions — to the Houston Texans in week 16 (#29 ranked offense) and the Oakland Raiders in week 17 (#28 ranked offense). Suffice to say, neither team had a great deal to play for. They also gave up a lot of points in 2013 for a 13-3 team. Remember, Seattle has the #7 offense. So they’re ranked higher than Dallas and Indianapolis, who combined for 81 points against the Broncos. And slightly worse than New England, who managed to register 34. You could argue there’s a lot of selective opining going on here. Don’t get me wrong — Seattle’s offense can improve. Third down and red zone performance has been surprisingly weak recently. Yet the Seahawks have still made big plays to offset these issues. And they’ve kept on winning despite that 22-point average since week 13. Without doing any real homework it’d be easy to point to trends. To the passer-by, Seattle’s offense is regressing and Denver’s defense is improving. In reality, the Seahawks have come through a stretch where they consistently faced top defenses with enough points to make a Super Bowl. Denver’s defense over the course of the year has given up a ton of points. And if you want one other myth busted tonight — look at how many points Denver have scored in their last two playoff games. Despite dominating T.O.P. against San Diego and New England, they put up 24 and 26 respectively. San Diego’s defensive rank in DVOA? #32 and dead last. New England comes in slightly better at #21. On Sunday the Broncos face the #1 defense. It might be worth adjusting some of those +30 point predictions for Peyton Manning and co. It wouldn’t surprise me if Peyton Manning didn’t attempt a pass beyond 15 yards on Sunday. Not because of the weather or any physical limitations with his 37-year-old body. Simply put, it makes little sense to attack Seattle downfield. They love to play physical at the line, but they’re also adept in covering deep. Manning isn’t going to zip passes over the top of this defense. Not a chance and he’ll know that. Long developing routes won’t be his friend either. Denver’s much vaunted pass protection is a product of Manning’s quick release. Without Ryan Clady watching his blind side, he can’t afford to be sitting in the pocket waiting on a downfield target. The way to exploit this defense will be underneath throws and finding ways to set up the run. It’s a pretty safe bet to imagine this could be Denver’s game plan. I think Demaryius Thomas will actually have a quiet game unless they get creative and move him around. It makes sense to have him run downfield taking away one of the corners. That will open up the underneath coverage and allow space for the crossing routes. If they have Thomas and Eric Decker coming up against Byron Maxwell and Richard Sherman, they’ll probably both be used as a decoys. I expect Wes Welker to get a lot of targets over the middle on shorter routes, plus the two tight ends. In fact I wouldn’t be shocked if Thomas and Decker are non-factors. At the end of the day, are you going to challenge Sherman and Maxwell with Manning’s arm — or do you fancy your chances throwing against Seattle’s linebackers and Kam Chancellor underneath? This will be about YAC and chipping away at the defense. Slow burning, patient and methodical drives. Denver has the players to dominate even with a fairly conservative game plan. Manning doesn’t care who he passes to. He’s going to snap and throw — get it out there and let the playmakers do the work. Some of those lesser known receivers and tight ends are going to get plenty of looks. Don’t be surprised if an Andre Caldwell, Jacob Tamme or Joel Dreessen ends up having a big day with a touchdown or two. There’s not really much Seattle can do about this. Field goals will have to be considered victories. It’ll be very difficult to win the field position battle because Manning’s going to get to midfield consistently, even if a drive eventually stalls. As for the running game — I think they’ll mix it in once they’ve got the passing game into a rhythm. If Manning gets into his stride early on the Seahawks should be concerned. It’ll really open up the run from the shotgun and Knowshon Moreno could have a field day on just a handful of calculated carries. Don’t underestimate how difficult it is to stop a Manning offense running the ball once he’s established the passing game. It can be frighteningly potent. Expect to see some screens too — but Seattle has done a fantastic job taking these away this season. At the end of the day you can’t stop this unit scoring points and building drives. The question is, can you limit them to enough points that your offense has a chance to win you the game? This is about damage limitation. However good this defense is — and it’s one of the best ever — you’re going to give up yards and points to Peyton Manning. Unlike his brother, he won’t sit in the pocket absorbing pressure before throwing a few ducks to be intercepted. He’ll snap and throw, challenge the linebackers in coverage and find ways to eat away. Field goals are not a bad thing. I don’t expect Manning to turn the ball over more than once. This is going to be about disciplined, containment football and good tackling. If Manning does attack underneath, make a tackle. When you get into those 3rd and short situations, run around and force an incompletion. San Diego beat Denver in week 15 by putting a lid on the passing game — and in the process taking away the run. If you can limit the damage, they’ll get no rhythm. Moreno ran for 19 yards on eight carries against the Chargers because Manning spent most of the game searching for his mojo. Andre Caldwell and Montee Ball were Denver’s two leading receivers on the night. If you can take away the big playmakers (Seattle has a shot with Sherman/Maxwell/Thurmond) and force Manning underneath and to his secondary targets — you can frustrate this offense. San Diego held the Broncos to 20 points and scored 27 to win. That will be the blue print for Seattle — and they’re capable of scoring more than 27. A lot of people expect Seattle’s big-time edge rushers to dominate against a sloth-like Manning. Unfortunately I can’t see the edge guys having much impact just because of the quick release. Cliff Avril and Chris Clemons will struggle to create pressure, let alone sack the quarterback. Michael Bennett has spent a lot of time outside recently and will probably suffer a similar fate. We might even see some three-man rushes to put an extra body in coverage. Instead this is a game for the interior lineman. If Tony McDaniel, Brandon Mebane and Clinton McDonald win at the snap, they are the ones who can collapse the pocket and force pressure. This is absolutely crucial and the only way to stop Manning getting into the zone. The balls going to be out before the edge guys can have an impact. The interior pass rushers have to win and get into Manning’s eye line. They also have to be disciplined enough when Manning audibles into a run play — especially if he finds a rhythm early. They can’t press and lose their shape. They have to remain organised and avoid trying to do too much. Those three players are pretty much the key to Seattle’s defense on Sunday. Plus Bennett when he lines up inside. In fact it might be worth using Bennett predominantly from the interior to max out his impact. 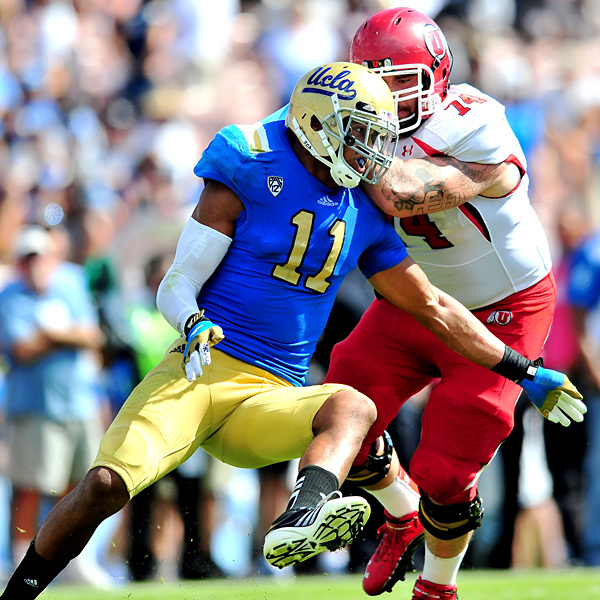 The linebackers will have to play the best games of their short careers. This is a huge challenge for Bruce Irvin, Bobby Wagner, K.J. Wright and Malcolm Smith. They’re going to be challenged to tackle well and cover the best they can. Walter Thurmond as the slot receiver is going to need to be at his sharpest to keep an eye on Wes Welker. Essentially you can’t stop Welker getting a step and making a catch — but you can make it a 3-5 yard reception instead of a 15-20 YAC effort. For all his attention this week I expect Sherman to spend most of his day running downfield with either Thomas or Decker on a decoy. I doubt Manning challenges him even once. I don’t think the cornerbacks will rotate. Sherman will stick to the left and cover whoever is outside — I doubt he sticks with Thomas. They seem to trust Maxwell a lot. The motto essentially needs to be field goals instead of touchdowns to give the offense a chance to win the game. Play smart, tackle well and rush the interior. I fully expect the Broncos to focus on stopping Marshawn Lynch. Denver’s passing defense, at least from a personnel stand point, isn’t a strength. Not with their current injuries. No Von Miller. No Derek Wolfe. No Chris Harris. Their best way to challenge Russell Wilson is by taking away the run and forcing Seattle to pass. The Seahawks have been dreadful on third downs recently. Putting them in lots of 3rd and +5 situations will be a real test. They have to stack the box and try to stop Lynch. Objective number one. The only problem is — Wilson has shown he can beat a superior defense using this game plan. New Orleans in week 13 completely sold out to stop the run. Lynch had 45 yards on the night — Wilson ran for 47 and passed for 310 more. If Seattle wins this game, I could see a similar stat line for both. But really, this is what Denver has to do. They have to try and stop the run, score regularly on offense and force the pass. Wilson’s threat as a runner will be a concern, however. In the AFC Championship game the Broncos defensive front consistently broke contain against Tom Brady. They won’t get away with it against a much more mobile quarterback. There’s easy running yards to be had there. If the Seahawks use the read option, Danny Trevathan might keep an eye on any QB keepers. This is another big area where the Broncos have to be ready. During the 2013 season the only mobile quarterbacks they faced were Terrelle Pryor, Robert Griffin III and Michael Vick. Pryor isn’t good enough, RGIII was mid-meltdown and Vick was on the brink of losing his job to Nick Foles. Wilson is a much greater challenge — and the Broncos might be a little unprepared for a player who moves as well as Seattle’s quarterback. I’ll be stunned if the Seahawks doesn’t utilise the read-option much more than they have in recent weeks. It’s not just the running of Wilson either. How do Denver keep a check on Percy Harvin? Last time he played the Broncos he had eight catches for 156 yards and two touchdowns. Admittedly this was pre-Manning in 2011 — although Manning won’t be playing defense on Sunday either. Denver struggled to contain Kansas City’s Dexter McCluster — he managed ten catches for 96 yards in two meetings during 2013. When the Patriots beat the Broncos in the regular season, Julian Edelman had nine grabs for 110 yards and two scores. They’ve struggled to cover smaller, quicker receivers. And neither Edelman or McCluster get close to Harvin’s explosive potential. Jack Del Rio may well make stopping Lynch his priority. Finding a way to stop Harvin will be problem #2. The national media have taken to Denver’s defense but this is a group missing its best pass rusher, best corner and a top interior lineman. It’s a team that had issues at safety anyway and is devoid of any real stars. Even a guy like Terrance Knighton — I’m not sure you’d swap him for Seattle’s Mebane the way he’s been playing this year. The Seahawks offense should have success here against what looks like a pretty overrated group. For those who want to argue otherwise. Look at Denver’s key players on defense. The Super Bowl narrative is Seattle’s offense is mediocre and won’t be able to keep up with Manning. A lot of people are missing the point. Manning has to contend against the #1 defense in the NFL. Seattle is coming up against the worst defense they’ve faced since week 11 (Minnesota). In a point scoring exercise against identical defenses, Denver would come out on top. But they aren’t facing identical defenses in the Super Bowl. There’s a clear advantage to Seattle’s offense there. The kind of advantage Denver cannot expect against the NFL’s top defense. My prediction is the Broncos will have success against Lynch and the running game because they’ll sell out to stop it. But Wilson will also be able to run for 45-60 yards and will make a few big plays in the passing game too. Harvin’s return is a huge positive. I hope Seattle works to protect him — avoiding throwing downfield too often where he becomes a big-hit target and instead using him as a YAC threat. I think we’ll see sweeps, designed runs and some quick screens and throws into the flat. Anything to get the ball in his hands quickly so he’s running at defenders. The receivers should have success competing against this secondary. Zach Miller might act mostly as a luxury extra blocker and a safety valve. I’m expecting Luke Willson to make his customary early play on offense. Why break with tradition? Overall this unit will make plays, just like they have all year. And if Denver can’t stop the run, it could be a very fruitful and balanced day for this offense. It’s absolutely vital they have a good day on third down. This has been an area of struggle for the Seahawks — even against San Francisco they were only 5/14. They also have to improve in the red zone. This has been a surprising issue this season. Wilson is the key and could be in line to complete his legacy with a MVP performance. Even if Terrance Knighton collapses the pocket — without Von Miller there’s very little edge speed to stop him moving around and making plays downfield. This is the type of opponent, like Atlanta, where Wilson can be at his creative best. He’s struggled mostly when teams like the Rams, Cardinals and 49ers can bring constant pressure from both sides with a four or five man rush. He gets flustered, doesn’t know whether to escape or sit and usually gets sacked. Here it’s unlikely he’ll face much edge pressure and if the interior has an impact, he can just scramble away from danger. For me the stars are aligning for Wilson to have a big day. Yet ultimately the Seahawks have a lot of good players on offense. I’m not sure many people realise how highly the offense ranked in DVOA. They’ll surprise a few people on Sunday. I’m not sure how I got it so wrong. My first impression of Aaron Donald was pretty middling. Sometimes when you watch full games instead of tape cuts, it’s hard to notice consistently good play. That’s the excuse I’ll roll with, but at the end of the day I just made a bad call. And he could be a first round pick. In going back to re-access his potential I wanted to focus on two games against very different opponents. I wanted to see how he faired against the best of the best — National Champions Florida State. And I wanted to watch him against a much less polished opponent — Bowling Green State. On both occasions he was superb. I couldn’t have been more impressed. Again — how did I miss on this guy so badly? I’ll get to the positives in a moment, but first here’s one lingering issue. You will be able to have some success in the run game versus Donald. As good as he is at getting into the backfield and having an impact, you can scheme against him in the run. He’s not an immovable object, and you wouldn’t expect that at 6-0 and 288lbs. When you face off against him 1v1 — he nearly always wins with leverage because of the size. Being small is actually a positive in that sense. He also has the hands and lower body power to excel in that type of situation. Yet when blockers take a different angle and try to stretch a run out wide, he can be moved. When he can’t set and get the hands up, the lack of size shows. That opens up cut back lanes and there are a few occasions where you think at the next level that would be exploited. Whoever drafts Donald is probably just going to have to live with the fact he’ll give up the odd big hole/run play. Even so, it might be worth it for all the positives you get as a pocket collapsing, dominating interior force. I liked Jordan Hill a lot last year and was pleased to see Seattle spend a third round pick bringing him in — even if his rookie year has been severely hampered with injuries. Donald is kind of like a top of the range version of Hill. In some ways they have a very similar game. But where as Hill flashed as a playmaker in the backfield, Donald practically lives there. Time and time again he collapses the pocket. He ended the year with 11 sacks but was probably responsible for a lot more. In the two games I watched he was consistently having an impact — driving blockers into the backfield, forcing quarterbacks to move out of the pocket and recording a splash. When he doesn’t get the sack, he’ll at least force a bad throw or get a teammate on the stat sheet. It’s been a while since I saw a defensive lineman this busy, causing so many problems for two very different opponents. In the FSU game I actually think he could’ve done a better job finishing, but the fact of the matter is he was there time and time again in position to make a play. I wanted to see how he coped against the best in college football and it was interesting to see how much success he had against the Seminoles. He was the only one causing Jameis Winston any problems. And Winston had a day for the ages — a truly sensational quarterbacking performance. He needed it too, with the way Donald was playing. Then I put on the BGSU tape hoping to see him clean up against a much weaker team. It’s unusual to see a defensive lineman just rag-doll a blocker, but there was Donald going to work. On a couple of occasions he practically tossed the guard or center into the quarterbacks lap. Remember the way we looked at the three technique position last year? I wrote this piece in February 2013 titled ‘The Bill Walsh defensive tackle’. It contains notes from Matt Waldman detailing what Walsh looked for when drafting players. The best defensive tackles move the offensive guard back into the quarterback. (emphasis mine) They won’t have nearly as many sacks as others, but if they can move the guard back into the quarterback, then the quarterback has to avoid his own lineman as if he were a pass rusher before he throws the ball. So this is a key ability. Even when he’s not getting on the stat sheet, he’s going to make life easy for the edge rushers. He’ll get the quarterback on the move, trying to make reads on the hop. He uses his hands well, makes the most of his leverage advantage, has a strong lower base that generates plenty of power, his first step quickness is right up there and he’s capable of slipping blockers with a quick swim move. Every time an undersized pass rusher like this comes onto the scene he gets compared to Geno Atkins. Perhaps for the first time, that comparison may be legit. Donald may never ever get anywhere near that kind of impact. There’s a reason Atkins is a bit of a freak of nature. But if there’s one player capable of getting into the league and actually making it happen at this size, Donald is your guy. One more time — I’m not sure how I got it so wrong before. A good team should consider him late in the first. A team with some edge rushers to compliment his ability to collapse the pocket. A team that can rotate their defensive linemen and limit some of the issues he’ll have against the run. In many ways Seattle would perfect for him. I think we should put him on the radar — especially if they lose Clinton McDonald to free agency. McDonald’s impact this year is really underrated — he had 5.5 sacks and it’d be an upset if other teams weren’t willing to reward him for that. In fact I’d put money on him ending up in Jacksonville. Spending a first rounder to replace McDonald might be overkill — but I do think it’ll be an option. You could argue Jordan Hill may be tagged for that role — and nobody should write him off after one year. But if Donald’s there in the late first, you have to consider it. One of Seattle’s biggest off-season priorities has to be getting a big bodied receiver for Russell Wilson to compliment the current group. If Kelvin Benjamin or Brandon Coleman are there at #31/32 they have to be in play. It’s the one area Seattle can really take a tangible step forward, particularly with the way they’re structuring the offense. They want to run the ball and hit big plays downfield off play action. Not having a starting receiver over 6-0/6-1 is conducive to that. A bigger red zone threat would also be nice, especially considering the struggles they’ve had recently inside the 20. Benjamin and Coleman aren’t just big — both have limitless potential. They’re also far from the finished article and need time. I’ll take a chance on either in the late first. If they’re both gone, then you look down the list at other needs. And maintaining the depth and quality of the defensive line has to be up there. Remember — McDonald isn’t the only free agent in waiting. Tony McDaniel and Michael Bennett are also set to hit the market. Donald is a really exciting player to watch. He could go in the top-25. His size could also see him last into the second round. Either way — I wouldn’t bet against him having a lot of success in the NFL. I’ve not watched the game, but hope to get into the tape as soon as it’s made available. The South team — coached by Gus Bradley and the Jaguars staff — sauntered past the North (coached by the mediocre Falcons group) 20-10. The distinct lack of quality on show made this a difficult one to get excited about. And it’s also worth remembering the overall talent level when considering how certain players performed. Auburn pass rusher Dee Ford was named MVP — collecting two sacks and a pass break up. You can see highlights of his day here. I like Ford as an undersized (6-2, 243lbs) speed rusher with limitations. But what kind of grade does he deserve? Is he capable of being more than just a speed guy? Is he going to be able to mix it up, show good hand use and get off blocks? Lined up exclusively at defensive end. Applauded numerous times by coaches for taking direction, playing with great pad level and competing. Quick and fast but easily handled at the point. WOWed scouts with his pass rush skill. Beat just about everyone around the edge showing incredible speed and quickness. Does a bit of wide edge rushing and a little one dimensional in that aspect. Simmered down compared to his performance yesterday. His speed rush skills are impressive but to be honest, he really did not show much in the way of variety and looked like a one trick pony. Today he destroyed Ohio State tackle Jack Mewhort for the first sack. What a complete mismatch. Mewhort had no answer for that kind of speed off the edge and looked pedestrian. On the second sack he’s lined up to the far right. This is taking the ‘wide-9’ to another level — he was so detached from the rest of the LOS. In that kind of situation it’s a pure foot race — and Ford was victorious on this occasion to get to Logan Thomas. 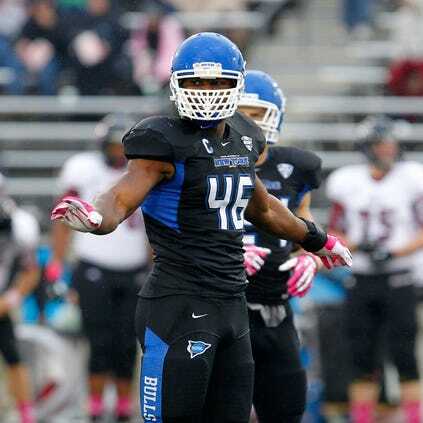 The lack of good edge rushers in this class will help Ford, but will he go in the first round? He’ll need to run in the 4.4’s at the combine (he’s capable of it). I still think he’s more of a solid second rounder but we’ll see. He also has a likeable personality. That’ll help. I’ve included Ford’s tape against FSU from the National Championship game at the top of this piece. Check it out. Remember when people were touting Tajh Boyd as a first rounder? He’ll struggle to get drafted at this rate. After a disappointing week at the Senior Bowl where he got slammed by observers, Boyd threw an absolute duck of an interception today. He finished with a stat line of 7/16 passing for 31 yards. The pick was a disaster. No pressure, thrown into double coverage with no velocity. He just hangs it up there to be picked. Good college quarterback, but that won’t cut it at the next level. The same goes for Miami’s Stephen Morris. He went 10/18 for 89 yards and two interceptions. 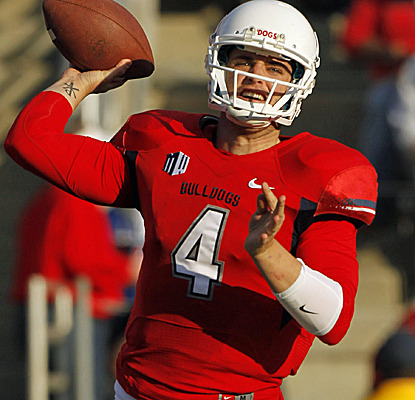 Out of all the quarterbacks on show here, the only one with a shot at making it is Derek Carr. Logan Thomas, though, is a nice project to try and develop even if his career petered out with a whimper at Virginia Tech. Thomas completed 4/5 today for 18 yards on a quiet afternoon. I’ll have further reaction to the game today when the tape becomes available. 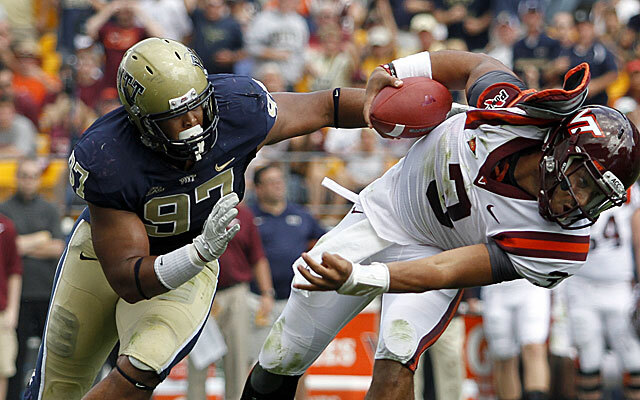 I’m also continuing to work on Aaron Donald again after his good week in Mobile. I think I will adjust my initial impression (I really liked his tape vs FSU, even if he could’ve finished on a few more plays) — but more on that later. Right from the start it looked like an underwhelming group. A lot of the big names were no-shows, citing injuries or a ‘business decision’. Yet it shouldn’t be a big surprise that this once excellent event is becoming little more than a combine appetizer. The sheer number of underclassmen entering the NFL is having a huge impact. This year it’s 98 turning pro, up from 73 in 2013 and 65 in 2012. Next years event is already setting up to be a complete stinker. With so few players lasting the distance in college, there just aren’t that many good Seniors that qualify. Even letting four-year juniors in hasn’t given it that much of a kick-start. The NFL and the NCAA need to get together and save the Senior Bowl. Not by allowing juniors in. But instead by addressing the real issue at play here. The crux of the problem is the new CBA. The big money isn’t there for rookies any more, not unless you go in the top ten. Agents are advising prospects to chase the second contract by entering the league as soon as possible. Unfortunately this is terrible advice. The average length of a NFL career is three years. A heck of a lot of players don’t see the end of their first contract, let alone get a second. Rushing into the league is not a good idea. For some players, they need that time in college. With certain positions — quarterback being a great example — you just can’t beat reps on the field. For every Richard Sherman out there — set to earn millions after going in round five — there will be countless players who don’t even make the cut in years one or two. This isn’t a big issue for the likes of Jadeveon Clowney, Johnny Manziel and Sammy Watkins — all guaranteed to go in the top-ten and be stars at the next level. It’s the guys who declare knowing they’re likely to be mid-to-late round picks that we should be worried about. Instead of trying to improve their stock on the field in college, they’re prepared to take their chances in training camp and on the practise field. Here’s an example of what could go wrong…. You’re a young receiver who gets drafted by a team with a bevvy of veteran starters. You struggle to beat out the experienced incumbents in camp. You’re only a 6th round pick, so you’re on the roster bubble. And hey — we have this UDFA who excelled and plays a position of greater need. Suddenly the guy who backed himself to make it as a late round pick is on the street looking for a job. Simply being in the NFL is not a guarantee you will get the best possible opportunity to showcase your talent. Are young players being told that brutal reality? Or are they being told “the quicker you get in the NFL, the quicker you can earn a second contract”? Here’s what a player should be told — enter the league when YOU are ready. Because being physically and mentally prepared for the NFL is what will help you succeed. And success will eventually get you a second contract, whether it’s for the big bucks or not. Every player is different. Some need extra time in college. Others can feel comfortable entering the league after a couple of years of college ball. But turning pro when you’re not ready can kill your career before it even begins. It’s concerning that this week the discussion has shifted towards allowing juniors to enter the Senior Bowl rather than addressing the bigger problem. If you let juniors into the event, it’ll be like throwing petrol on a bonfire. Yet another thing to encourage young players to jump before they’re ready. It’s all about education and information. Spell out the facts and have NFL personnel talk to players as they go through college. Make it clear — you are not guaranteed that big second contract. Many of you won’t make the grade. The fortunate ones who work their asses off will be rewarded. We’re sending 100 players into the league this year and many have been sold an unrealistic dream. It’s time to save the Senior Bowl — and in the process save a few careers too. Sprained his ankle during the drills and won’t play in the game this weekend. Listed between 6-6 and 6-7, 298lbs with close to 34 inch arms. Not a production machine in college but certainly a guy who fits the three-tech role currently accommodated by pending free agent Tony McDaniel. Keep an eye on this guy. Underrated tight end with great size and an all-round game. 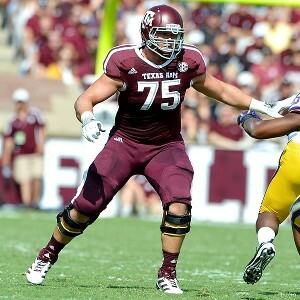 Athletic enough to be a catching threat, but also big enough to develop into a good blocker. Fresno State don’t use the tight ends that much in the passing game, but Jensen could be a late round steal. 6-5 and 250lbs. Lots to like here. Technically one of the best offensive linemen you’ll see entering the league. For me he’s been a top-20 prospect for some time. 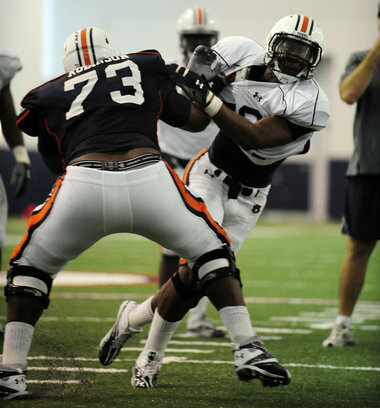 Arm length might lead to a move inside to guard, but don’t bet against a team giving him a shot at left tackle. If he is projected as a guard, he’s the only one with a shot at going in round one for me. It’s a poor year for the position. I think with Hageman you’ve got to expect some rough edges. At times he looks like a big time pass rusher. He just doesn’t do it consistently enough. I expected his stock to sky rocket at the Senior Bowl, but that inconsistency has continued in Mobile. For a team like Seattle, that could be a good thing if he ends up dropping to the late first. 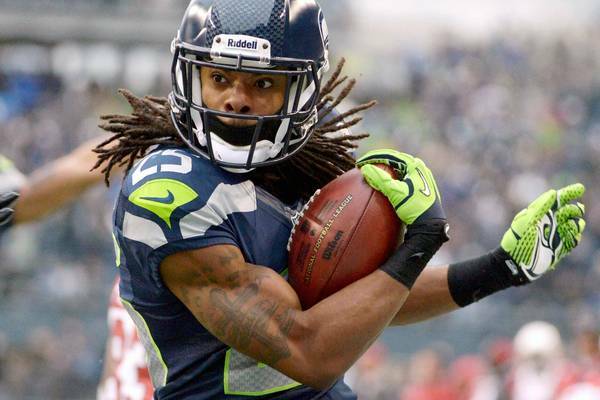 Richard Sherman -- second best player in the Super Bowl? Mike Sando and Matt Williamson spend their time wisely. One can only imagine how long it took to rank all 106 players involved in the Super Bowl. But it makes for a fascinating read. Peyton Manning tops the list, but the rest of the top ten is dominated by Seattle. It’s an insider article and you’ll need to subscribe to see it all. I’m not going to reveal too much, but the following is all over Twitter so we’re not breaking any rules. Richard Sherman is #2 behind Manning. Earl Thomas (#3), Marshawn Lynch (#4), Percy Harvin (#6), Michael Bennett (#7), Russell Wilson (#8), Brandon Mebane (#9) and Kam Chancellor (#10) are the other Seahawks named in the top ten. Demaryius Thomas is the only other Bronco among the elite at #5. The one moderate surprise for me is Cliff Avril way down at #17. Alongside Bennett he’s been sensational in the second half of the season and the playoffs. How many other players can boast seven forced fumbles for the year? Overall the list shows that really this is a battle between the deepest and most talented team in the NFL against a legendary individual. Manning, as the #1 on the list, is more than capable of winning the Super Bowl for Denver. He can carry that team if needed. But if Seattle’s top ranked defense restricts him from finding a rhythm, rushes the passer with consistency and avoids penalties — I’m not sure the rest of the Broncos roster can compensate. The Seahawks are the better team. Denver has the best player. So who do you think should be favoured? Again, I’ve not been able to catch any of this years coverage. So I’m passing on second hand info rather than offering my own take. Eventually work out tape will appear on Youtube. I’m asking for a bit of patience right now, but we’ll get into it eventually. One player I’m interested in based on reports so far (I’m still using Tony Pauline as my go-to-guy) is Nebraska cornerback Stanley Jean-Baptiste. He’s 6-2 and 215lbs with 32 inch arms. We all know Seattle likes size and length at corner. A physical edge won’t hurt either. Jean-Baptiste is someone we’ll get into during the process, especially if they end up requiring new depth at corner for next season. I’ve never been impressed with Donald’s tape. He looked pedestrian. I’m also sceptical that he’ll have the same impact against better interior blockers. The 2014 class is thin at guard and center anyway, let alone at the Senior Bowl. But it’s hard to ignore the universal thumbs up he’s getting from every observer in Mobile. I’ll go back for another look at the tape this week to see if my first impression was inaccurate. I fully expected Ra’Shede Hageman to blow up the Senior Bowl — but he hasn’t so far. On the injury front, Virginia defensive lineman Brent Urban’s picked up a sprained ankle and won’t take any further part. He’s one to watch for the Seahawks and could easily land in round one. Notre Dame offensive lineman Zack Martin — one of my favourites this year — has excelled. He’s a top-20 talent and looked the part throughout his college career. Measurement wise he looks like a guard but I can’t see teams like Miami and Arizona passing on him. Both desperately need a good left tackle. Martin is a complete natural and oozes technique. He’s just about the most polished college lineman I’ve seen. Even more so than Alex Mack when he entered the league in 2009. He’s not a fit for the zone blocking scheme and shouldn’t be an option for Seattle, even in the mid-rounds where I think he’s going to land. Jensen really is one to keep an eye on. So much upside. BYU receiver Cody Hoffman, however, has reportedly looked sharp. Morgan Moses (T, Virginia) — had a hit and miss 2013 but has all the physical qualities to go in the first two rounds. Bryan Stork (C, Florida) — really intelligent, personable guy with talent to match. Dee Ford (DE, Alabama) — appears to be excelling as a speed rusher. Lacks length. Might be a one-trick pony.